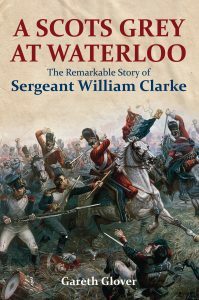 Once in a while a real gem of a personal narrative written by a soldier in the ranks who fought at the Battle of Waterloo is still discovered and this narrative by Troop Sergeant Major William Clarke of the 2nd Royal North British Dragoons (Scots Greys) is certainly one of the best I have ever read. It has to be wondered where these treasures appear from after two hundred years, but in this case we do have some reasons which may explain why it has lain hidden for such a long time. This huge single volume of over six hundred hand written pages was recently purchased by the John Rylands Library at Manchester as an anonymous unpublished Victorian novel giving the story of two soldiers discussing their lives over a few beers in a public house. It is probably because of this, that this failed ‘novel’ had simply sat within the collection of a Manchester bookseller for many years, largely ignored until his widow offered it to the library a couple of years ago. Luckily John Hodgson, Joint Head of Special Collections at the John Rylands and I have had some previous contact over the huge archive of General Henry Clinton’s papers also held at the library. John had rightly identified that although written as a novel, that there appeared to be the account of a genuine soldier who had fought at Waterloo in the Scots Greys running through the account, as it betrayed a very high level of knowledge of the life of a soldier. Although the book is anonymous, it at one point identifies the main character as simply as W.C., which John had surmised might well refer to Troop Sergeant Major William Clarke of the Scots Greys. At this point John kindly contacted me and I eagerly arranged to travel to the library to view and photograph every page to investigate it further and to transcribe it ready for publication. William Clarke has left us two other short accounts of Waterloo which can definitely be attributed to him with certainty, a letter which he wrote to his parents dated from Nanterre near Paris on 8 July 1815 and a set of ‘Extracts from the Journal of Sergeant William Clarke Scots Greys’ which is held by the National Library of Scotland. Having studied these two versions, and then comparing them carefully with the soldier’s tale as depicted within the novel, it is perfectly clear that it is simply a much fuller description of his experiences at the Battle of Waterloo; indeed before his description of Waterloo begins in the ‘novel’, he has abandoned such pretentions and simply narrates his experiences. The ‘novel’ in fact describes all of the military career of William Clarke from his enlistment in 1803 until he was discharged from the army in 1825, including his years on ‘Home Service’ across Britain including Ireland, often carrying out operations on the ‘Prevention Service’ with the local Customs Officers or ‘Policing’ the cities at times of unrest. He paints an intriguing and fascinating picture of military life in the army of George III, but more particularly, he describes Waterloo, particularly the day after the battle, when he was part of the ‘Burial Party,’ in finer detail than anyone else I have ever read. His story culminates with an exceptionally detailed account of King George IV’s state visit to Scotland in 1822, William’s last great event before he retired. Everything that is described coincides perfectly with the known service history of William Clarke, including his marriage in Ireland in 1809, this is without doubt the life of Troop Sergeant Major William Clarke. William Clarke was born at Prestonpans, Haddington, Scotland in 1785 and having tried work as a farm labourer and a gardener, he eventually enlisted for life at the age of eighteen into the Scots Greys at Glasgow on 19 July 1803 and began to learn the role of a cavalryman. William was a particularly fine specimen of a man for this period, being recorded at 6 foot tall (1.83 metres), with dark brown hair, grey eyes, and a brown (swarthy) complexion. He officially served as a private for 4 years and 306 days, becoming a corporal in 1808; in which capacity he then served for 5 years and 13 days before he became a sergeant in 1813; finally becoming a troop sergeant major after a further six years to the day on 1 August 1819. He finally served a further 6 years and 212 days before he was discharged from the army at Norwich on 21 December 1825. His length of service was officially listed as 22 years and 166 days, plus 2 additional years for serving at Waterloo. William retired to become a gardener, although he is recorded in his discharge papers as being ‘worn out from length of service’. As to his conduct in the army, his official record would appear to be unblemished, his promotion being steady and he never suffered demotion for any misdemeanours; but his discharge papers record intriguingly that his conduct had been ‘good, with the exception of having involved himself in pecuniary difficulty’. This may indicate that he may have got into trouble with the troop finances, but no official sanctions ensued, beyond perhaps a gentle ‘persuasion’ to retire. William Clarke was however forty years of age and it was normal to retire at such an age, so perhaps it was not serious enough to cause his dismissal, we will probably never know. William does occasionally mention having a brother named Mark, in the army, who also served at Waterloo, both luckily surviving without a major injury, Mark only receiving a slight wound in the right leg. The only Mark Clarke that can be discovered in the records who came from Scotland and served at Waterloo was a private in the 79th (Cameronian Highlanders) Regiment of Foot. If indeed as seems likely, this is William’s brother, then their parents were John Clark and Betty (nee Bene). He was apparently two years younger than William being born on 6 November 1787 at Kilmadock near Perth, but he was also recruited when aged eighteen at Glasgow for ‘unlimited service’ on 28 June 1805, his previous career also listed as a gardener. On his army records, Mark is shown as having been a little shorter than William at 5 foot 9 inches tall (1.75 metres) but with a similar colouring, having dark brown hair, grey eyes and a dark (swarthy) complexion. Mark saw a great deal of service with the Cameronians, serving at Copenhagen in 1807, Portugal & Spain in 1808, the Walcheren campaign, Portugal, Spain and Southern France from 1810-1814 including serving at the siege of Cadiz, the battles of Bussaco, Fuentes d’Onoro, Salamanca, the siege of Burgos, Nivelle, Nive, Toulouse and of course Waterloo, where he served in Captain Maclean’s Grenadier Company. The regiment also served at Corunna and Vitoria, but presumably Mark was absent sick or on detached duty on these occasions. Intriguingly, Mark was discharged from the army as ‘unfit for service’ within six weeks of his brother on 6 February 1826 at the age of 38 having served 22 years and 219 days (including his 2 years for Waterloo). His general conduct was listed as ‘indifferent, but now improved’, perhaps hinting at why he never rose in rank. William also mentions marrying whilst in Ireland and the records do show one marriage at Dublin in 1809 between a William Clarke and Isabella Manders but no other details can be discovered and there is another reason to doubt this is the correct wedding. He rarely mentions his wife and never by name, but his letter home from Waterloo to his parents in Scotland would seem to indicate that his wife might still reside in Ireland at this time. In this 1815 letter however, he also mentions that he has two daughters, one of which has recently been born. There are few baptisms recorded at Dublin for a father named William Clarke, but one stands out – that of Mary, baptised 22 June 1815 at St Michael & John’s in Dublin to a William and Mary Clarke (nee Macavity) which fits perfectly with a girl born whilst he was serving in Belgium. There is also a record of an Elizabeth being baptised on 5 January 1812 at St Mary’s in Dublin City to a William Clarke and an unnamed wife (left blank). These could be William’s two girls, but unfortunately the records are poor and William never mentions them again. I do however suspect that our William married Mary Macavity in 1809. Unfortunately, nothing certain has been discovered regarding the deaths of William, Mary or his brother Mark either, the name Clark or Clarke being too common to identify a death with any certainty. I have reproduced the entire text as written, only adding chapters to aid the reader and footnotes to help identify individuals and places. Particularly in the early chapters, William does occasionally provide conversation in his text in Old Scottish; which to many will prove unintelligible, where this occurs I have added an English translation in [brackets], I can assure the reader that in many instances this is very necessary! In the early chapters, where William’s story is in the format of a novel, it can be a little challenging, but I can assure the reader that if you persevere, you will discover a fascinating account of the military career of a young Scot’s Grey, you will learn much and revel in a description of Waterloo and its aftermath which is second to none. This is William’s story…..
 John Rylands Special Collection Reference ENG MS 1439. Published by the editor in his Waterloo Archives Volume 1. This is taken from his Army Records, but no birth or baptism record has been discovered. Being recruited for ‘life’ rather than a fixed term would earn him a much higher bounty payment for joining. It is strange but true that a great number of recruits to the Army were recorded as having grey eyes, this is markedly at odds with the percentage of grey eyes in the British population. If anyone checks the number of days against his ‘official’ service record they will realise that there is a minor mistake made in the calculations and that he actually served 24 years and 179 days. The army records show his surname without the final ‘e’.